Random pick from the library. Not quite memorable book but still contains some wise pieces of advice how to be leader and enable people to be innovative (appropriate offices, relevant people, good competitive atmosphere, wise budgeting, etc.). Nothing new, nothing to be discovered but put in a very tangible way. Writer's style is very nice and easy and the book can be "swallowed" in couple of hours. Very very short yet constructive book with many pieces of advice regarding leadership. If you are (or want to be) the leader you should definitely read this small guide and take to heart most of the hints. The most valuable for me was the part saying that leader works for the team, not the opposite. Leader is the team's servant! And leader should lead people not manage them (i.e. managers usually show the way to achieve the goal, they drive people - leaders don't) - difference between manager and leader. Not because of the contents but layout. Yes - Microsoft is not even able to publish correctly a book. I have an excellent sight, I don't use glasses (although I read a lot), but I was hardly able to read this book because the letters are too small. Generally book is also too wide i.e. there are too many words in one row. You may think that this is unimportant? Try to read this book then! About the contents. 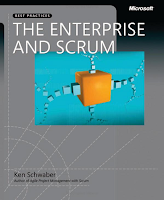 Author tries to answer the question "How to introduce and implement Scrum in the enterprise?". He gives a lot of examples which are very interesting and save the book. In general the book is boring and over intellectualized (IMHO). Yet I think that if you work in big enterprise and would like to implement Scrum you should read this position. Absolutely brilliant book! If you don't know what Scrum is and would like to get to know it quickly, this book is for you. Great style, a lot of pictures ;) easy to understand with real-life examples. This book also gives you insight into doing Scrum with XP - it really works. This book rocks! Couple of hours reading, btw. I have to read this book again because during many of its pages I was sleeping. It is somewhat boring, however it contains invaluable and timeless knowledge on how to keep your team/company productive and what can limit the team's efficiency. It focuses many aspects of development team's life and gives a lot of real-life examples. This book made me thinking for a long time. Another brilliant book on leadership and team management subject. Author gives us excellent book in which he tells a story (it is not a user's guide book). This book is letters in 90%. While reading it you identify with characters given in this book which makes it much easier to understand and put oneself into presented problematic situation - this was the intention of the author, of course. This book is really really great and everyone who is in position of power (or wants to be :) has to read it. It is probably classic management book by now. Boring, boring, boring (2nd edition)! Only examples save this book. I'm really disappointed with this book. It is a classic one! If I didn't know what was XP about it would be hard to learn about it from this book. 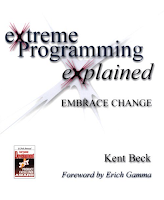 Besides that I really love the last chapter (or last but one) when Kent describes how they "invented"/discovered XP. The best book I've read recently. More so, Mike Cohn is my favorite author after reading this book and the next one (see below). If you want to have productive development team that collect requirements in an effective way, write User Stories. 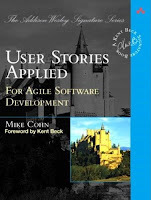 If you want to learn how to write User Stories - buy this book! The style is genial, the contents is awesome and the examples (including case study) are just amazingly easy to implement in practice. After reading this book you can immediately start implementing Scrum and writing excellent User Stories. A bit over intellectualized book. 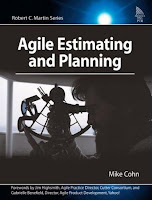 Mike Cohn put a lot of effort into making this book credible, thus you can find many references to scientific works on estimating and planning subjects. Sometimes I was thinking I'm reading a scientific book which was hard ;) but the author uses brilliant examples that keep you focused on reading. Again the case study is just genial - you read, you think and you can implement it in your project. This is definitely the book you should at least read. As you can see the second method is ten times slower. In any case I do not recommend using either of the shown techniques in the production code. You should consider using AspectJ in a pure form (don't like it) or Spring Framework AOP capabilities (most preferable way).